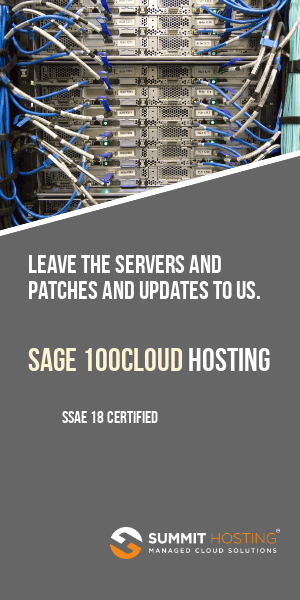 If you are interested in using Sage ERP MAS 90 but don’t want to setup your own server or maintain the level of hardware that might be required for an online implementation – you should consider Sage’s cloud implementation of Sage ERP MAS 90. This version offers most of the current MAS 90 modules in convenient monthly pricing. Here is the frequently asked question list as distributed by Sage which provides answers to many questions that users have. Additionally you can review a MAS90 Online price list here. 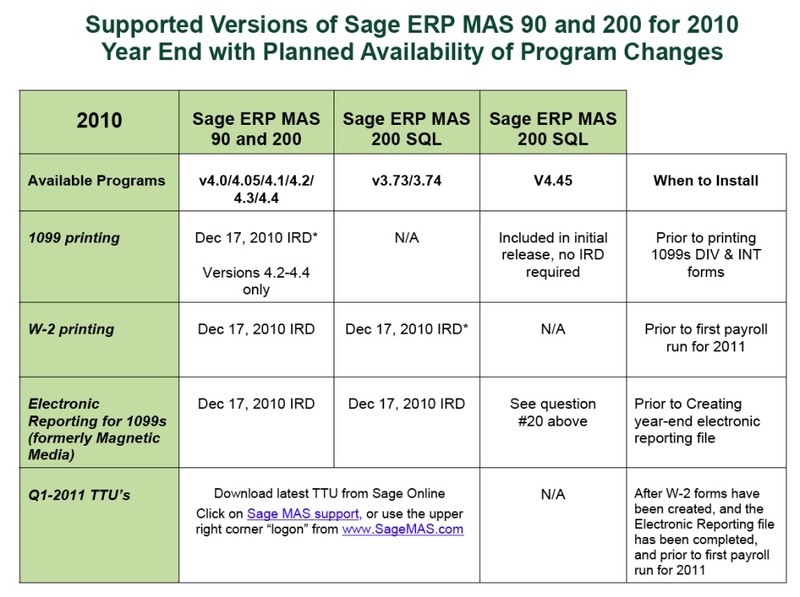 Sage have just released their MAS90 and MAS200 2011 frequently asked year end questions. Is an IRD required to print 2011 W2 forms with MAS90 or MAS200? minimum before installing the year-end IRD. I am running payroll on MAS90 or MAS200 4.5 – do I need to download the IRD? No. All of the program changes included in the IRD are also included in 4.5. However, you will still need to download and install the Q1 2012 Tax Table Update before processing your first payroll for 2012. Do I need to download the MAS90 2011 IRD if I’m using the Federal and State eFiling and Reporting feature? Yes, if you choose to use Sage ERP MAS 90 and 200 version 4.3 or 4.4 Federal and State eFiling and Reporting, you will need to apply the IRD. 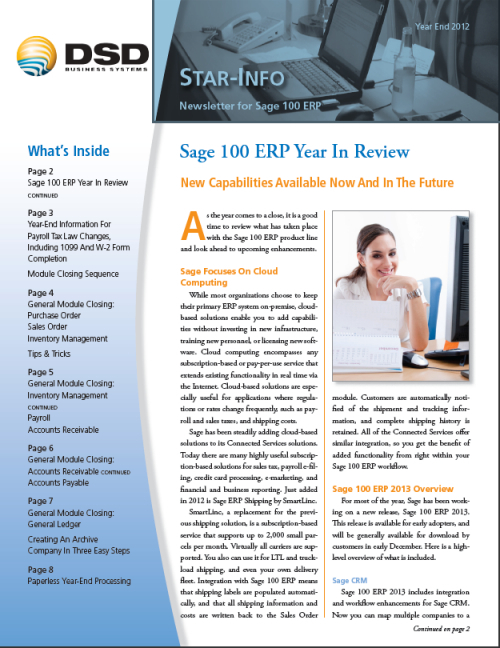 When will the year-end Sage ERP MAS 90 and 200 Federal and State eFiling and Reporting updates be available? 20, and the system will prompt you to apply the online automated update. made available on the last business date before the twentieth. When will the year-end Tax Table Update (TTU) and Interim Release Download (IRD) for Sage ERP MAS 90 and 200 be made available? How can I obtain the TTU or IRD if I do not own a current Sage Business Care Plan? to get a logon and access the information I need? have issues with obtaining a logon, please email us at tools.na@sage.com for assistance. module to create the media for your state filing. Does the IRD contain changes to Payroll to support the Cost of Employer-sponsored health coverage reporting? DD on Form W-2 Box 12 is included in this IRD. Yes. The ability to include Code EE on Form W-2 Box 12 is included in this IRD. Will I be required to print my W-3 on the red, preprinted form when using Federal and State eFiling and Reporting? 1. Do I need to download the 2010 Interim Release Download (IRD)? 2. Do I need to download the 2010 IRD if I’m using the Federal and State eFiliing and Reporting feature? 3. 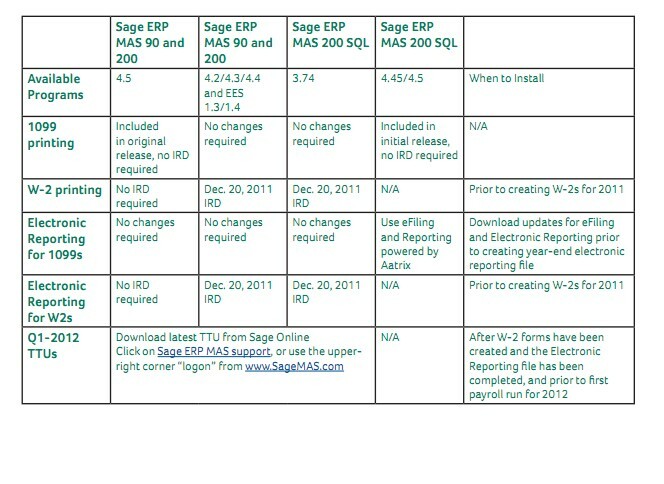 When will the year end Sage EPR MAS 90 and MAS 200 Federal and State eFiling and Reporting updates be available? 4. When will the year end Tax Table Update (TTU) and Interim Release Download (IRD) for Sage MAS 90 and MAS 200 be available? 5. Will I be required to print my W-3 on the red, preprinted form when using Federal and State eFiling and Reporting? 6. How will the year end Tax Table Update (TTU) and Interim Release Download (IRD) for Sage ERP MAS 90 and MAS 200 be made available to Customers, Business Partners or Sage Accountants Network members? 7. I do not have access to the Internet from my Sage ERP MAS 90 or MAS 200 server. How can I obtain the year end Interim Release Download program update and TTU to install them on my server? 8. How can I obtain the TTU or IRD if I do not own a current Subscription plan? 9. I’ve never been to Sage MAS Supprot, and I don’t know if anyone else from my company has either. What do I do to get a login and access the information I need? 10. After I downloaded the TTU and IRD, do I install it on my workstation or on my server? 11. We file Local Withholding Tax on our W-2s and we’re using Federal and State eFiling and Reporting, what extra steps do I need to take? 12. What changes were applied to the Electronic Reporting Module? 13. Previously, I’ve filed employees W-2’s via Magnetic Media. Are there any changes? 14. I’m supposed to electronically file my W-2s in the EFW2 format, so why does Sage ERP MAS 90 and MAS 200 show a MMREF-1 format? 15. For companies who must print 1099 forms, are changes required this year? 16. I was formerly required to file Form 1099’s via Magnetic Media, but now need to file 1099’s via Electronic Reporting using the Internet. What do I need to know? 17. Where can I find information on how to do year end processing for any module? 18. Where can I purchase W-2 and 1099 forms 100% compatible with my Sage ERP MAS 90 and MAS 200 software? 19. I have an Extended Solution enhancement. Will I need to update it after installing the 2010 Interim Release Download? 20. I am using Sage ERP MAS 200 SQL 4.45 and need to file 1099s. What do I need to do? 21. Does the IRD contain changes to Payroll to support the Qualified Employee Reporting as allowed by the HIRE Act? 22. What is new in eFiling and Reporting this year? 23. Will the IRD be included in a Product Update or Service Update? An updated list of Sage’s Frequently Asked Questions about their eFiling service. This convenience service is included in all versions of Sage ERP MAS 90 and MAS 200 version 4.3 and higher. It enables the printing of many tax forms to plain paper and for an added fee Sage will electronically file many of your payroll tax forms.